Here at Evoz, we’re dedicated to making products that fit your life. 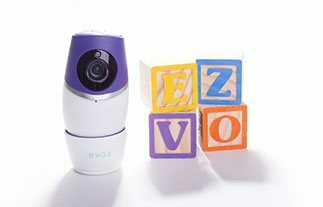 Our Evoz Smart Baby Monitor works with the Evoz Baby app for iOS and Android to turn your smartphone into a baby monitor. 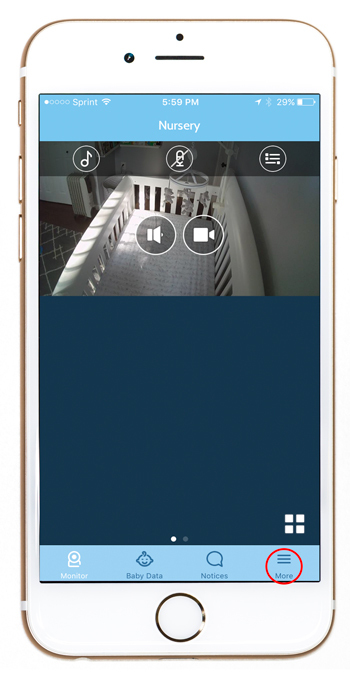 The WiFi baby monitor lets you keep track of your baby from anywhere, right on your phone: no more carrying around an extra receiver. But you probably aren’t the only one who takes care of your baby. What if your spouse wants to check in from work? Or you want the babysitter to keep track of feeding and nap times? Or Grandma wants to take a peek at your angelic sleeper even when she doesn’t live close by? In this post we’ll talk about sharing monitor access with all the lovely people in your child-raising village. 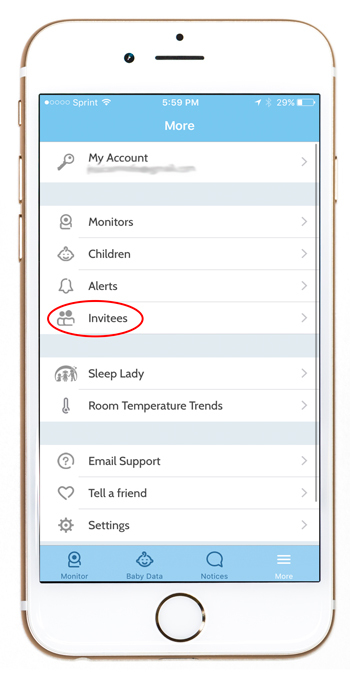 To share access to your monitor, launch the Evoz app, navigate to the More tab (iOS) or app menu (Android), then choose Invitees. On the Invitations screen, you’ll see a list of people who currently have access to your monitor. (You can change or revoke someone’s access at any time – simply tap their name here.) To share access with someone new, tap Send New. So what are partners and guests? A partner has the same access to the monitor as you have: use this type of account for co-owners of the monitor (like, say, your partner!). 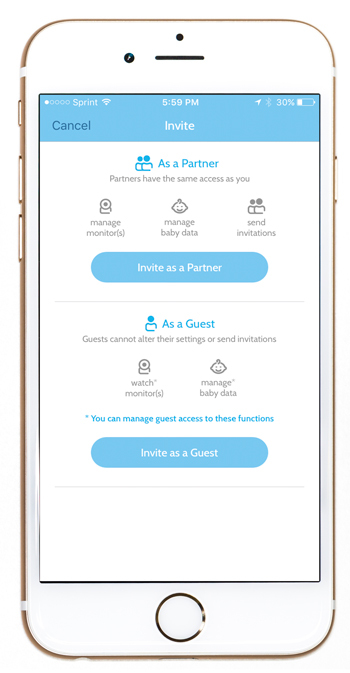 Partners have 24/7 access to the monitor and can change monitor settings, manage baby data, and send and revoke sharing privileges. A guest has more limited access. 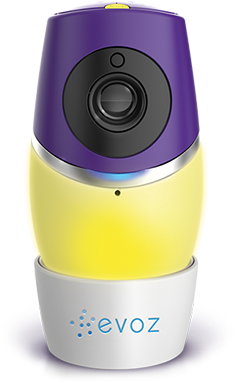 You can choose which monitors they see, whether they can enter baby data, and when they have access. 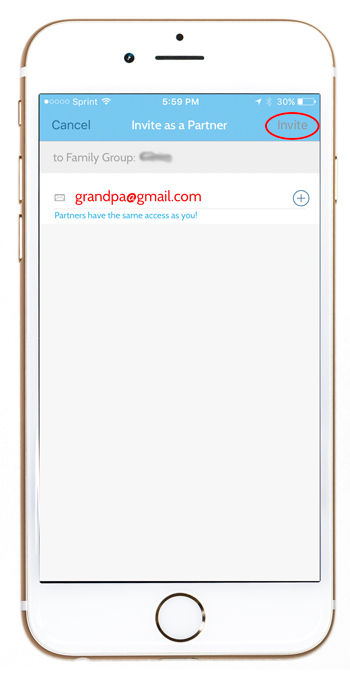 To share access with a partner, Click “Invite as a Partner,” then enter the person’s email address and tap Invite. That’s all! They will receive an email invitation from Evoz Smart Parenting with instructions on how to accept their invitation. Then they just need to download the Evoz Baby app from the App Store or the Play Store, sign in, and start sharing! 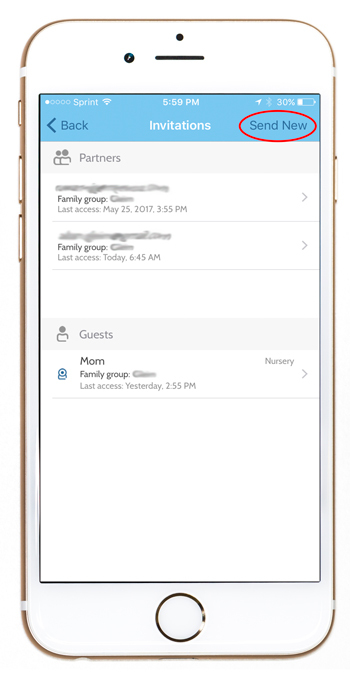 To share access with a guest, click “Invite as a Guest” on the Invite screen. You’ll see the Invite as a Guest Screen, where you can control the level of access you want your guest to have. Enter the person’s email address at the top of the screen. Turn on Monitors to share access to the monitor image and sound. Click the thumbnail images of individual monitors to select or de-select them. Turn on Baby Data to share access to the baby’s data. 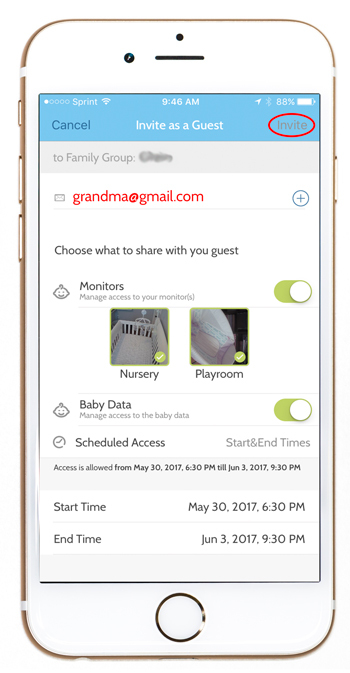 Guests with Baby Data access can both view and enter data like sleep times, feeding times, diaper changes, and height and weight. 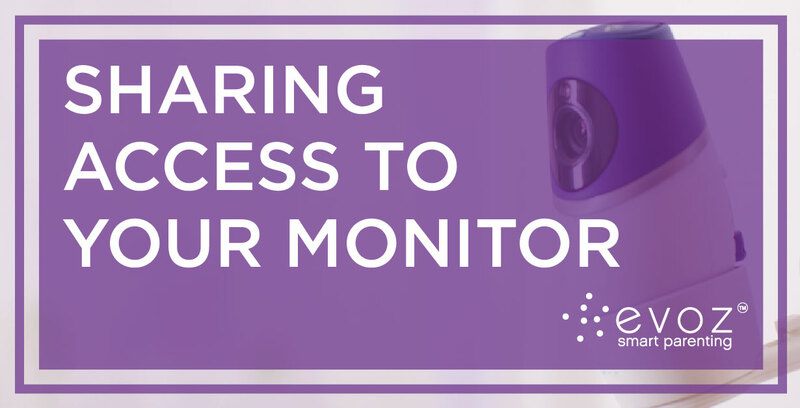 Use Scheduled Access to control when the guest is allowed to access the monitor data. Choose Always if the guest should always have access. Choose Weekly to limit access to certain days of the week. You can click on individual days to select and de-select them, and set the times you want access to start and end (this one time period will apply to all of the selected days). Choose Start&End Times to allow access for a limited time period. When you’re ready, tap Invite. Your guest will receive an email invitation from Evoz Smart Parenting with instructions on how to accept their invitation. Then they just need to download the Evoz Baby app from the App Store or the Play Store, sign in, and start sharing! As always, if you have any questions feel free to contact us directly at support@evoz.com.